Young flyers will take just 49 minutes and 47 seconds to ask the dreaded, ‘’are we nearly there yet?’’ so with parents battling the boredom threshold, Emirates has teamed up with Dr Sandi Mann, a psychologist and boredom specialist at the University of Central Lancashire to find a solution. Dr Mann has worked with the airline to create the Child Boredom Quotient (CBQ), helping parents identify the exact moment their kids will get bored so they can enjoy stress-free travel. 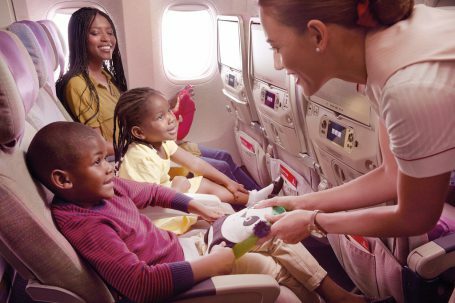 Jade Cobbs, Emirates Cabin Supervisor, comments: “We understand that parents often dread the idea of travelling on a long-haul flight with bored children. The research was conducted by Censuswide on behalf of Emirates in June 2017. Data was secured via an online survey and the sample consisted of 2,006 UK parents with children between the ages of 0 – 12 who have been on a plane. To help create the Child Boredom Quotient, Dr Sandi Mann also observed 90 children aged between 6 months – 11 years old at play to determine how children behave in real-life.